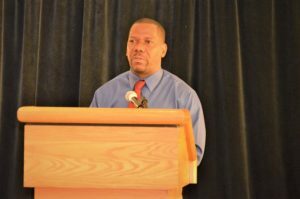 Basseterre, St. Kitts – The State of the World’s Children Report of the United Nations International Children’s Emergency Fund (UNICEF) launched Dec. 11 by the Department of Social Services in St. Kitts. The report was first published in 1980 and focuses on key issues such as disability, gender, adolescence, maternal health and children in a digital world. Patrick Knight, communication specialist for UNICEF, gave an overview of the 2017 World Children’s Report, which focuses on children in the digital age. He explained that the report outlines the different ways in which digital technology affects children. “Digital technology has changed the way you communicate on a daily basis and has changed the way our children communicate,” he said, as he noted that the increase in access to online communication around the world is causing a significant change in childhood. He stated that the report identifies that youth between the ages of 15-24 are the most digitally connected, specifically in the Caribbean with high Internet and mobile penetrations, spanning more than 75 percent. Knight said that connectivity can be a benefit and a game changer for many of the world’s marginalized children by helping them to fulfill their potential and break generational cycles of poverty. He further noted that digital technologies are now providing better opportunities for learning and allow children to access information that affects the world around them.